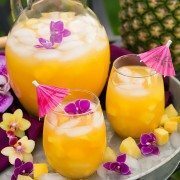 I’m loving the Hawaiian flavors lately. 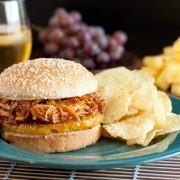 I made Hawaiian BBQ Pulled Chicken Sandwiches a few days ago (which were amazing if I do say so myself =) and I had some left over fresh pineapple so I thought, why not make another Hawaiian inspired dish. These sandwiches are packed with the flavors of the Islands. 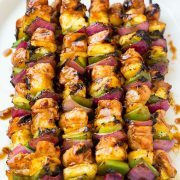 I tried to think of all foods that remind me of Hawaii when making this recipe (even though sadly I’ve never been there, what is up with that??). Of course I thought of Hawaiian Pizza, one of my favorites with it’s ham and pineapple combo. Then I’d say the first type of nut I think of when I think of Hawaii is Macadamia, and can you have a chicken salad sandwich without some kind of nut? Also, I wanted to add a bit of sweetness to the dressing (but don’t worry it’s not overly sweet) so I added in the honey and pineapple juice. I don’t like a really thick dressing over my chicken salad but if you do you could omit the pineapple juice and add a few more tablespoons of the mayo or some Greek yogurt. 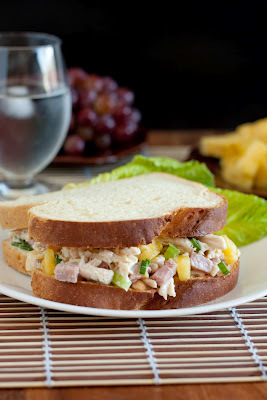 I hope you love these delicious Island inspired sandwiches! May they make you feel as though you are vacationing in Hawaii. Enjoy! 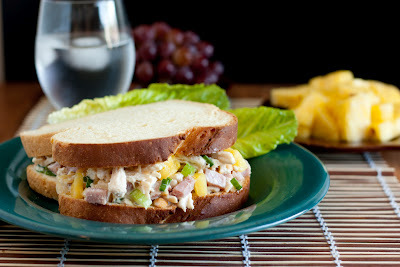 Chicken salad sandwiches covered with a creamy dressing and packed with Hawaiian flavors. In a large mixing bowl, toss together shredded chicken, diced ham, pineapple, celery, nuts and green onions. In a separate mixing bowl, whisk together mayonnaise, pineapple juice, honey, apple cider vinegar, onion powder and season with salt and pepper to taste. Pour dressing over chicken mixture. Toss to evenly coat. Serve on Crusty Rustic Bread, Hawaiian Sweet Bread or whatever bread, roll or croissant you'd like. I have one question hawaiin dish always using pineapple , what is that reason ?